Lucifer is ascociated with siruis. Apparently lucifer gets energy from the siruis star system, sirius is the place where the evil energies come from in many occult and ancient beliefs. Research chris everard claimed that "Some prominet astronomers who have joined sectret societies have dedicated to evoking the spirit of lucifer by using telespopes, I am not the only person who says this, many books have said that there observatories that train the lense on sirius and concentrate the light, and in the infintesimal beam of light from the telesope there are people performing rituals evoking the spirit of lucifer while bathed in the light from the telescope"
As said in OP the Lucifer part of the telecope is the part which is situated in the infintesimal small part of the beam where the light from the LBT is focussed to. I think the vatican have believed in aliens for along time. I think too, but they hide it from the rest. "As to the names of the mirrors (2) in LBT we simply refer to them as SX m1 and DX m1. SX and DX being shorthand for left and right in Italian (the Italians are 25% partners in LBT and played a major roll in the design and construction of the telescope mount). 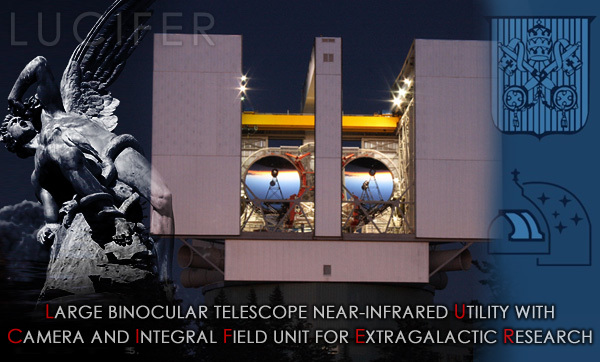 One of the major instruments used on LBT, an infra-red camera/spectrograph, is called Lucifer. Lucifer was built by the German astronomical community, which has another 25% of the telescope." Been browsing through old threads. Found this one. Definitely deserve more attention.